The Sunday readings in Lent have been showing us the high points of salvation history—God’s covenant with creation in the time of Noah; His promises to Abraham; the law He gave to Israel at Sinai. In today’s First Reading, we hear of the destruction of the kingdom established by God’s final Old Testament covenant—the covenant with David (see 2 Samuel 7; Psalm 89:3). His chosen people abandoned the law He gave them. For their sins, the temple was destroyed, and they were exiled in Babylon. We hear their sorrow and repentance in the exile lament we sing as today’s Psalm. But we also hear how God, in His mercy, gathered them back, even anointing a pagan king to shepherd them and rebuild the temple (see Isaiah 44:28–45:1,4). God is rich in mercy, as today’s Epistle teaches. He promised that David’s kingdom would last forever, that David’s son would be His Son and rule all nations (see 2 Samuel 7:14–15; Psalm 2:7–9). In Jesus, God keeps that promise (see Revelation 22:16). 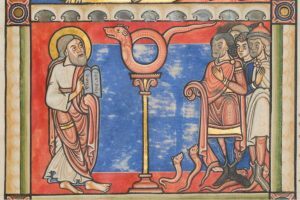 Moses lifted up the serpent as a sign of salvation (see Wisdom 16:6–7; Numbers 21:9). Now Jesus is lifted up on the Cross, to draw all people to himself (see John 12:32). Those who refuse to believe in this sign of the Father’s love condemn themselves—as the Israelites in their infidelity brought judgment upon themselves. But God did not leave Israel in exile, and He does not want to leave any of us dead in our transgressions. We are God’s handiwork, saved to live as His people in the light of His truth. Midway through this season of repentance, let us again behold the Pierced One (see John 19:37), and rededicate ourselves to living the “good works” that God has prepared us for.